Exit polls from South Korea’s presidential election indicate that liberal candidate Moon Jae-in will be the country’s next leader. Although the latest election was done in the wake of a massive corruption scandal, at least one South Korean news service decided to have a bit of fun with the results. Certainly weird, but far from the first time this latest election has been rendered through popular culture. Overwatch character D.Va—a South Korean pro gamer turned mecha pilot named Hana Song in the Blizzard shooter’s futuristic setting—has been turned into a feminist icon in the country in the wake of the corruption scandal surrounding ousted president Park Geun-Hye. The game itself even became part of one candidate’s political campaign. 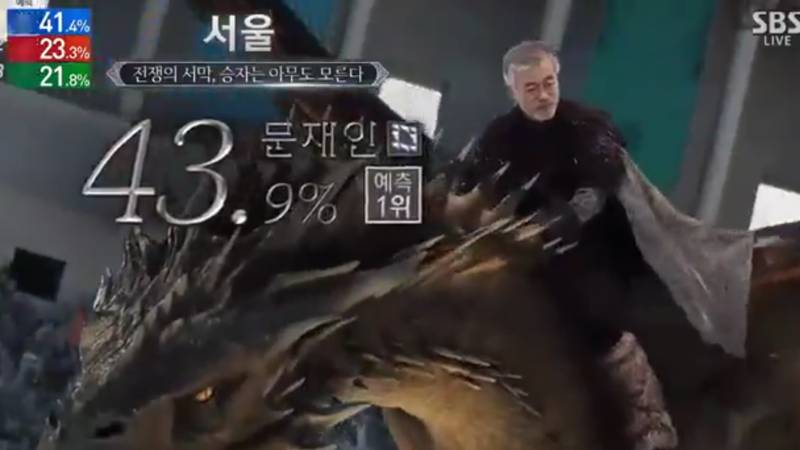 Hopefully Mr. Moon’s presidency in South Korea will be less fraught than the life of someone on Westeros’ throne usually is.